ATFIH: Businessmen loyal to Egypt’s president are handing out cash and food to poor voters as they try to gather tens of thousands of signatures to support his bid for re-election in March. President Abdel-Fattah el-Sissi is virtually assured of winning a second four-year term. Nearly all prominent critics have been jailed, left the country or gone silent. Three presidential hopefuls, including a former prime minister who could have lit up the race and a human rights lawyer, have withdrawn. A retired general has been arrested. That has raised the distinct possibility that the March 26-28 election will effectively be a single-candidate referendum, similar to those held by autocratic leaders in the decades before the 2011 uprising. With a comfortable win all but guaranteed, el-Sissi has repeatedly called on Egyptians to vote, perhaps fearing that a low turnout could undermine his legitimacy. That the vote is staggered over three days appears designed to maximize participation. Businessmen loyal to el-Sissi are meanwhile holding signature drives in which poor Egyptians register their support for the president and are given cash or food handout. It’s another practice that hearkens back decades when ruling parties dispensed patronage in return for support. Presidential candidates must secure the “recommendations” of at least 20 lawmakers or 25,000 voters in order to get on the ballot. El-Sissi already has the backing of hundreds of lawmakers, so the signature drives appear to be a largely symbolic undertaking designed to showcase the president’s popular support. In Atfih, a dusty town some 100 kilometres (65 miles) south of Cairo, several residents said they were paid 100 pounds (about six dollars) each in exchange for their signatures. They said supporters of a local lawmaker and workers at a charity run by a businessman, Tareq Salman, were touring the area in cars urging residents to sign recommendations for el-Sissi. Those who agree are transported free of charge to the local notary office, they said. On Thursday, Salman led a festive procession of hundreds of people from the charity he runs to the local notary office to hand over recommendations for el-Sissi. “I am not interested in elections, but this cash is heaven’s gift to me,” 47-year-old housewife Haniya el-Miligi said after she took part in the march. “We will definitely vote for him (el-Sissi) in the elections if there will be more cash,” said Nasser el-Gamal, 50, a local farmer. Salman said he hopes to secure at least 30,000 signatures from the town’s 100,000-plus voters. He denied any quid pro quo, saying residents sign voluntarily because they support the president. “This is not a bribe. People here are poor and we just help them like we do all the time,” he said. Another signature drive was underway earlier this month in Malek al-Salih, a poor Cairo neighbourhood. Awatef el-Sayed, a 65-year-old homemaker, was among dozens gathered outside a notary office over the weekend, waiting to go in and sign recommendations for el-Sissi. “They told us we will get a bag of rice, sugar, cooking oil as well as 50 pounds (about three dollars),” she said. The cash and food, she said, would come from a charity run by Mohamed Abu el-Enein, a pro-government businessman. “We were forced to do this. I know he (el-Sissi) will win anyway,” said Suad Mohammed, a 43-year-old widow who was waiting in line outside Abu el-Enein’s charity office to hand over the recommendation in return for cash and food. “I don’t care who is paying for this. Life is tough and people like me need money,” said one man as he emerged from the charity’s office carrying a bag full of food items. He declined to give his name, fearing retaliation. The Associated Press placed multiple phone calls to Abu el-Enein, an aide and his charity seeking comment, but none responded. 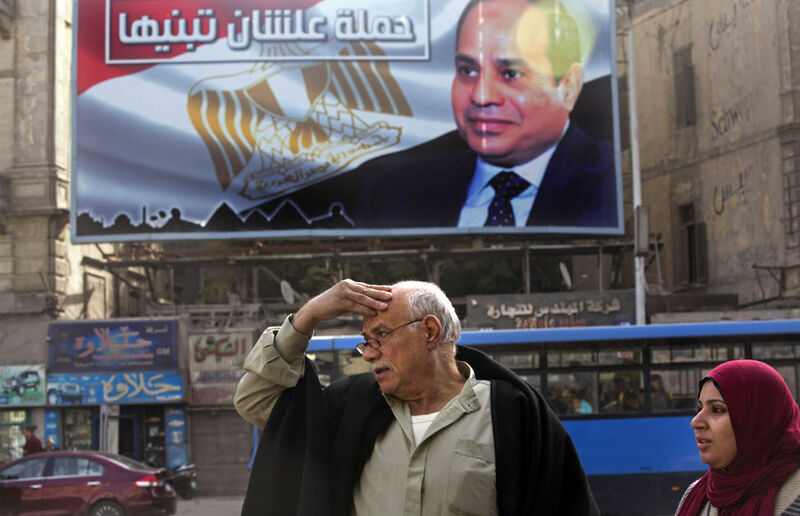 Vote-buying and the intimidation of opposition supporters were common features of Egyptian elections before the 2011 uprising that toppled Hosni Mubarak and raised hopes of a transition to democracy. As defence minister, el-Sissi led the military’s 2013 ouster of Egypt’s first freely elected leader, the Islamist Mohammed Morsi, whose one-year rule proved divisive. Since then, the government has waged a harsh crackdown on dissent, jailing thousands of Islamists along with hundreds of secular activists, including prominent figures from the 2011 uprising. Street protests have been effectively banned, human rights groups have been placed under severe restrictions and many critics in the media have been silenced. El-Sissi says such measures are needed to restore stability after years of unrest and combat an Islamic State-led insurgency. The campaign of Khaled Ali, a human rights lawyer who had hoped to run in March, recently released a clandestinely shot video of Cairo residents haggling with an unidentified man over cash payment in exchange for recommendations for el-Sissi. The campaign said its own supporters faced delays at notary offices, and that security agent at some offices had threatened to arrest them. Khaled Abdel-Hameed, a senior campaign worker, said the intimidation was so severe in Sharqiya, a Nile Delta province, that supporters were instructed not to pursue recommendations there. On Wednesday, Ali announced at a news conference that he would drop out of the race. Mahmoud el-Shareif, the spokesman of the National Election Commission, declined to comment on the allegations of vote-buying and intimidation, saying the commission only responds to formal complaints submitted by those who intend to run.